In the city, the mountains and the country, biking is becoming more and more popular. But few cyclists realize all the benefits of their chosen sport. 20 minutes of biking can reduce your stress for over 2 hours. It's cliché, but true: biking is good for your health! Besides the physical benefits, all that extra oxygen to the brain increases concentration, memory and energy. All those "happiness hormones" give your mental health a huge boost. It's good for the mind and the heart. Whether you take up road biking, mountain biking or fatbiking, or rent a bixi, you're helping the economy along! Local businesses like Cycles Devinci have boosted Quebec's reputation around the world. Have you ever calculated how much of your budget is taken up by transportation? And of course, cars are right at the top of the list. It's good for your finances. Help reduce the production of carbon monoxide this summer. It's the perfect time to hop on your bike and take advantage of every opportunity to pedal your way around town: to the grocery store, the pharmacy, restaurants, while visiting family and friends... Maybe you'll become addicted, and join the ranks of those who bike year-round. 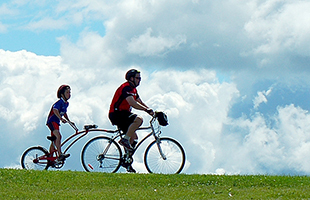 $1 for your bike travel this summer goes to projects aimed at promoting healthy lifestyles. All that pedal pushing can help our young people get more active at school. How? By recording how many kilometres you've rode in Desjardins's Cycling makes us all winners group odometer. For every new participant, $1 will be put in a "small caisse," all the money from which will go to supporting projects aimed at promoting healthy lifestyles in young people. Make you feel like going for a spin? Hop on your bike and come ride with us! 2 By choosing many types of transportation (biking, taxi, carpooling, public transit) over solo car use. Source: Vélo Québec. I like to have that money back to my Checking account .